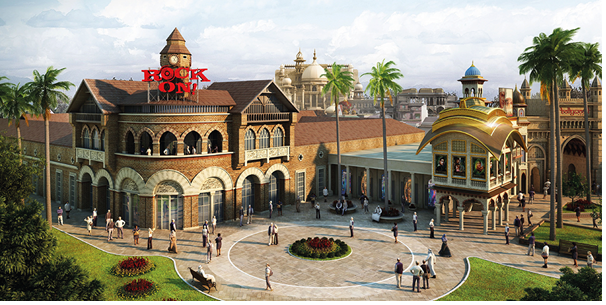 Bollywood PARKS™ DUBAI is the first Dubai theme park in the world that is dedicated to all things Bollywood. Prepare to encounter action and adventure, romance and comedy, music and dance, and a whole lot of flavour – Bollywood style! 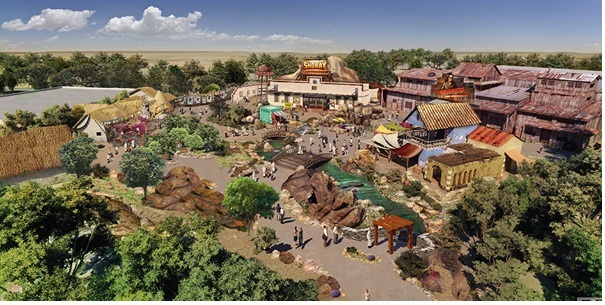 – for the duration of your visit at this fun and fabulous theme park. 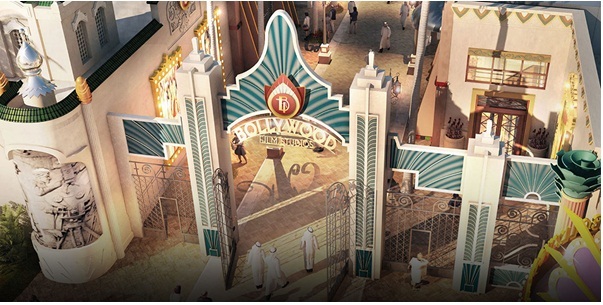 Comprising of five zones, which we will explore in this little guide, Bollywood PARKS™ DUBAI celebrates Mumbai’s legendary film industry through a number of Bollywood buster-inspired zones, live entertainment, stage performances and cinematic rides. At Bollywood Boulevard you will be able to lose yourself in a vast selection of entertainment options, cafes, street-style food carts, and retail stores. This zone is designed to dazzle and awe you, and gives you an insight into the what goes on behind the camera and the bright lights. You can get a glimpse behind-the-scenes of a Bollywood movie production at Cinemagic featuring Zindagi Na MilegiDobara, enjoy a delicious meal at Rock On! !, a stylish restaurant with live music, and enjoy a flamboyant song and dance performance at Crossroads. Mumbai is known as being the city of dreams and glamour, in addition to being the home of Bollywood itself. You can see a little piece of Mumbai at Mumbai Chowk, a zone that is inspired by the modern classic Don. Mumbai Chowk brings alive the soul of Mumbai, and give you the opportunity to get in on the action at Don: The Chase – where you join the dangerous world of Interpol agents and help them chase a slippery mafia boss, and enjoy the Mumbai Express – a chugging train that has been an ever-present image in many a Bollywood film. Picture a colourful village landscape of Rural India, that is what you will find a replica of when you wonder through Rustic Ravine. You will be transported to the authentic hustle and bustle of middle India where you will experience the chaos of the streets and the aura of what it would be like standing there in the flesh. For those who like to get in on a bit of the action, the Dabangg: Stunt Spectacular Show will give you just that. You can enjoy Bollywood songs and dance, while the action unfolds in front of you. What’s more, you can step right into a rural celebration with Lagaan: Champaner Cricket Carnival, where there are a number of fun and exciting games to keep everyone entertained. The Royal Plaza allows you to visit and enjoy a different era and enjoy the opulence and splendour that it provides. Right at the very centre of the Royal Plaza is the Rajmahal Theatre, which acts as the heart and soul of Bollywood Parks™ DUBAI, as well as an iconic landmark in itself. The Rajmahal Theatre will play host to the regions first ever Broadway-style Bollywood musical that will include song and dance and a whole lot of entertainment. Another zone that offers the utmost shopping, dining and entertainment experiences, Bollywood Film Studios featuring Hall of Heroes is the place to wine and dine, shop until you drop and indulge in an array of awesome entertainment – as well as the place to meet some Bollywood Heroes! Pop into the Rangmanch – an open-air venue – where you can see a number of village-style song and dance performances on stage, or soar through the skies with Krrish: Hero’s Flight which is a 4D flying ride that give you panoramic views of India’s landmarks in addition to taking part in an epic battle to save the Earth from an alien invasion! 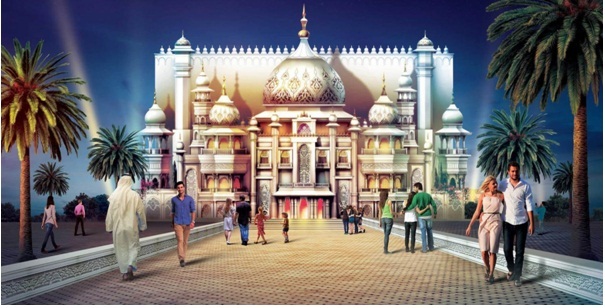 Bollywood Parks™ Dubai offers you and other visitors a window into India’s amazing entertainment industry in a fun and enjoyable atmosphere.